Our latest tester, Karen Collura, is testing the Hammer Brick. Karen is a 3-time USBC Womens’ Titlist in the classic division. She is also a 4-time Canadian National World Cup Titlist among other accolades. She is a low speed, rev dominant bowler. 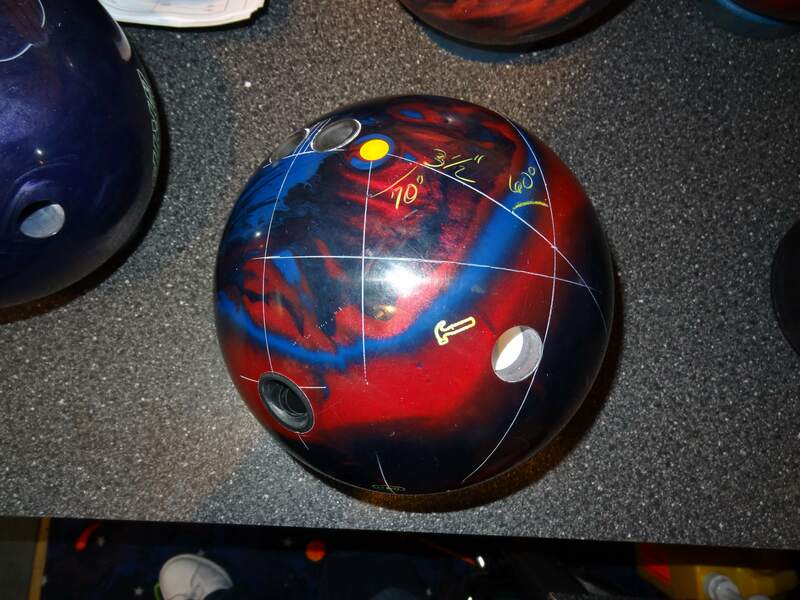 The ball was drilled by Eric Deaton of Strike-Mor Pro Shop in Etobicoke, Ontario, Canada. The ball was tested on Kegel Easy Street used as the house shot as well as the Viper pattern. Karen’s PAP is 5″ and 1/4″ up. The ball is drilled 70 x 3 1/2 x 60. This is a wider drilling angle which allows the ball to get into a roll later. The 60 degree VAL angle allows the ball to have a slower transition at the breakpoint. The 3.5 inch Pin to PAP on this asymmetrical ball will allow a lot of flare with more side roll. The Hammer Brick is definitely a strong piece. It made it’s mark in the way it transitioned and seemed to roll true. This was a lot of ball for your typical house shot. This is really a strong ball with a price point just under the high end Taboos. Pretty good value hear if your version of value is strength to price. The Brick mirror plane asymmetric core has an RG of 2.50, differential of .052, and a mass bias of .08. 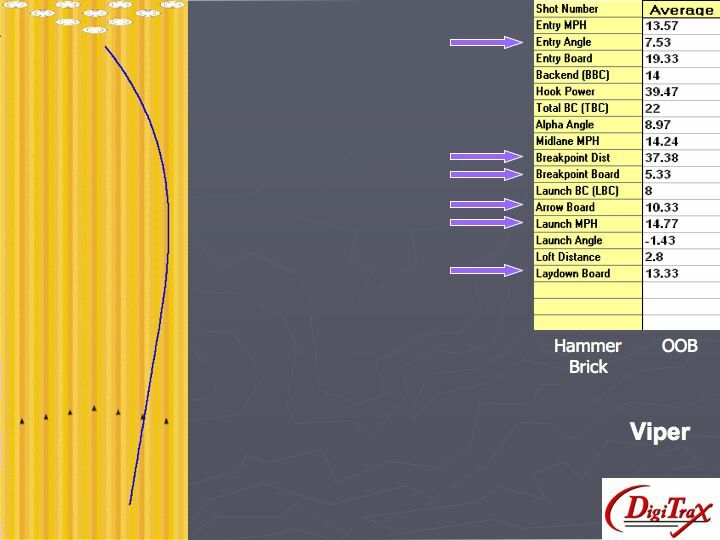 Hammer claims that this design allows for high ball reaction tweakability. With a name like the Brick, I expected something that looked like a brick… Usually core shapes dictate ball reaction shape so I was expecting something specific. Hammer uses the Grand Theft Reactive cover that was used on the original Taboo, but in Hybrid version. The out of box finish is 500/500/1000/2000. So it is dull when you first get it. If you’re into that sort of thing, the cover looks much nicer shined up. To that end, it takes to polish and surface changes well. The overall reaction stays pretty similar so you don’t get huge surprises when you make surface adjustments. More on that in the next section. 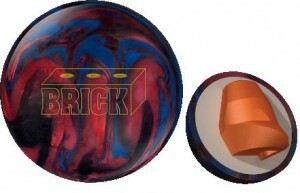 If any one thing stood out for the Hammer Brick’s ball reaction, it was it’s heavy roll. Once it made its move at the breakpoint, it seemed to roll very true and heavy into the pocket, offering good continuation. In the OOB finish, it is very strong. You have to watch out if your THS is less than 40 ft as our Easy Street test pattern is. This ball will work better on longer patterns where you worry less about it checking up from a shorter pattern. We tested the Arson last year. When comparing the two, the Brick definitely has a more defined breakpoint and more continuous. The Arson and Brick have very different ball reactions. The Arson will be smoother overall, transitioning a bit slower while the Brick will appear cleaner through the fronts and making a quicker transition, with a much heavier roll into the pocket. You may have to watch out for stone 9 pins for you righties. In our video, you will see the Brick on the 38 ft Kegel Easy Street pattern which is basically a THS. Most house shots are between 42 and 38 feet. This being a bit shorter, you can see the ball reaction. As is typical for a strong ball like this, it’s not ideal. The ball sometimes bleeds too much of its energy, coming in to the pocket a bit on the softer side. However, carry was still good. You will also see what happens when we change the surface to 4000 abralon with some polish. Although it didn’t change the line to the pocket, it became much easier to handle. I think this was the more remarkable thing here which you can see in the Digitrax analysis. The line was almost identical between the two finishes, but Karen could more easily get the ball consistently to the pocket with just a bit more stored energy. There was less issues with the ball potentially burning up, although you could still see the ball would fair better in a heavier or longer condition. We also tested the ball on Viper. You may think why Viper? Although it is 37 ft, it is a pretty heavy oil pattern. Remember Bill O’Neill using the Taboo on the Viper Championships? Maybe surprisingly, the ball worked well. Karen was able to play 10 to 5. You can again visualize the true and heavy roll into the pocket in the sport pattern video. In this case, the ball was strong enough to bite through the heavy oil and then make its strong move. Take a look at the high entry angle numbers on the Digitrax analysis and you can see why this ball drives so hard into the pocket. This is an interesting offering from Hammer. 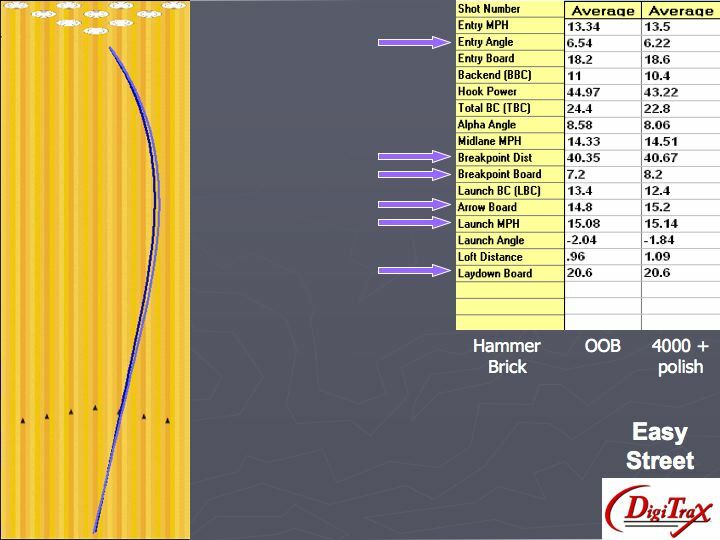 It’s stronger move at the breakpoint, heavy roll, and capability to handle heavy oil should make Hammer aficionados happy. Keep it on heavier oil and it will be happy, and in turn, you will be happy.